Asphalt shingles are the most common type of roof covering in North America. They are cheap and relatively easy to install. Read on for the basics of how to shingle a roof. Ensure you have all of the proper tools for installing shingles, as well as the necessary safety equipment. This includes a nail gun or hammer, roofing nails, chalk, tin snips, work gloves, proper shoes and a safety harness. Decide which kind of shingles you want. The two main types are 3-tab and architectural. Energy Star certified asphalt shingles with cooling granules are also available. Make sure you purchase enough shingles to complete your roofing shingles installation. Prepare your roof for a roofing shingles installation.Remove all old roofing materials, including all nails and flashing. Do not install over an existing roof. Evaluate the roof bed, and make any necessary repairs. Install the underlayment, the water resistant layer in between your roofing shingles installation and the roof bed. Install the ‘drip edge,’ the flashing on the outer edges of your roof deck. Next, you need to install the starter strip, or the first layer of shingles. Use the chalk to mark the exact centre of your roof, going vertically. Center your first starter shingle in the middle of the chalk line, and nail into place. Continue on installing shingles for the length of your roof. Working in 'courses', continue installing shingles the entire span of your roof according to manufacturer’s instructions. Trim your shingles to the necessary size when you reach the edge of the row. When you reach the ridge of your roof, install the ridge shingles. Lastly, clean up all debris and enjoy your roofing shingles installation. 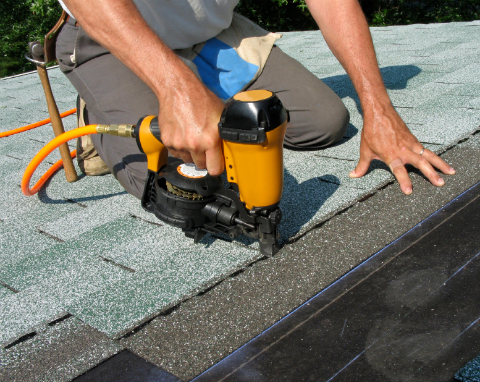 In contrast to other types of roofing, learning how to shingle a roof is relatively easy. In fact, installing shingles seems simple at first glance. However, as with any skilled work, there are many tips and tricks of the trade that can mean the difference between a solid roof and a leaky one - an expensive mistake. Hiring a qualified contractor for your roofing shingles installation will ensure your roof will be under warranty, and far more likely to be covered by your insurance company in case of bad weather. If you do decide you want to learn how to shingle a roof, make sure you do your research, and do not skimp on safety equipment. Saving a few bucks on a roofing shingles installation is not worth a broken back.